For many people, Labor Day marks the beginning of the college year, and a return to academic pomp and dignity. But did you know Columbia was only founded because New Yorkers couldn't stand that New Jersey had a college? And UPenn fudged its founding date to beat Princeton? Learn all the dirty secrets of American academia. New College (a.k.a. Harvard): Located in Massachusetts. Founded 1636, chartered in 1650. The College of William and Mary: Located in Virginia. Founded and chartered in 1693. College of New Jersey (a.k.a. Princeton): Located in New Jersey. Founded and chartered in 1746. College of Philadelphia (a.k.a. University of Pennsylvania): Located in Pennsylvania. Founded in 1740, chartered in 1755. King's College (a.k.a. Columbia University): Located in New York. Founded and chartered in 1754. Rhode Island College (a.k.a. Brown University): Located in Rhode Island. Founded and chartered in 1764. Queen's College (a.k.a. Rutgers): Located in New Jersey. Founded and chartered in 1766. Dartmouth College: Located in New Hampshire. Founded and chartered in 1769. Much like a sports record tainted by steroids, there should be an asterisk next to the University of Pennsylvania's (Penn) founding date. All of the other colonial colleges, save Harvard, have the same year for their founding as they do for when they were chartered. Harvard's founding date is tied to the year Massachusetts' legislature voted to set aside funds to build a school. Of course, Harvard could use either its founding year or its charter year and still be the oldest. Penn, on the other hand, not only has never used the charter as its founding date, it also changed its official founding date more than a century after the fact. Originally, Penn used 1750 as its founding date, but then changed it to 1749 — probably reflecting the first meeting of the founding trustees. That was the official founding date... until 1899. See, in 1895, it was decided that academic processions would have visiting dignitaries and officials proceed in order of their institution's founding. So in 1899, Penn changed its official founding date in order to make itself older than Princeton. Basically, Penn had bought a building that had been part of a 1740 plan to start a school. That never happened, but Penn claims it assumed the educational mandate of that 1740 plan and therefore was founded in 1740 and not 1749. Dartmouth, on the other hand, can very easily trace its founding to 1755 when Eleazar Wheelock founded Moor's Indian Charity School to train Native Americans as Puritan missionaries. 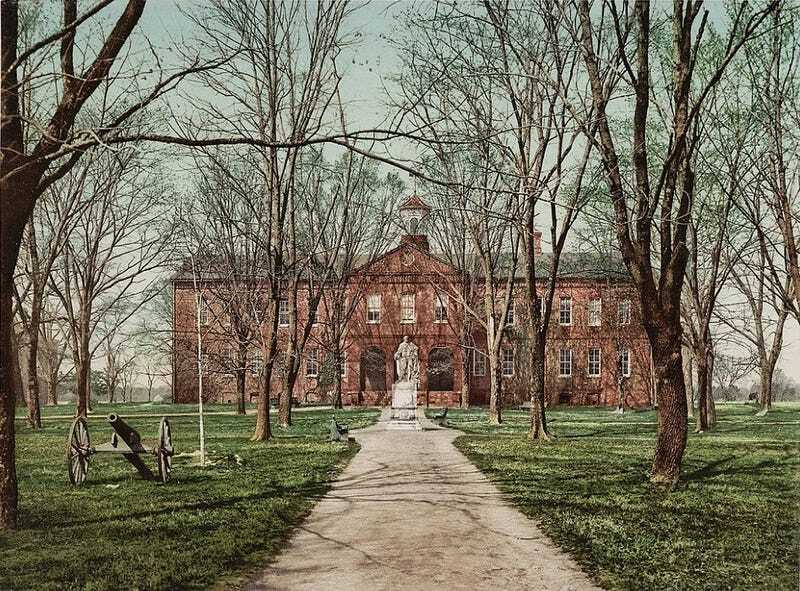 When the school had trouble attracting Native American students, Wheelock moved it to its current location and received a charter from New Hampshire to establish a college "for the education and instruction of Youth of the Indian Tribes in this Land... and also of English Youth and any others." Although it was named after the 2nd Earl of Dartmouth, Dartmouth College's namesake opposed the college's foundation. He had supported Moor's Indian Charity School but was not a fan of this new incarnation. Despite some of the weirdness of those founding dates, they're actually pretty important. Harvard was founded only six years after Puritans had settled Boston. And after Yale, there's 45 years before the next college appears. Why? Well, according to New England's First Fruits, the first ever fund-raising document by an American college (but, sadly, not even close to the last), it was "to not leave an illiterate Ministry to the Churches, when our present Ministers shall lie in the Dust." For the Puritans, it was important to have an educated ministry. And it wasn't like they could send their kids to England for it. Puritans were dissenters and at odds with the Church of England. And Oxford students were periodically required to swear oaths of allegiance to the crown and to the Church of England, which the Puritans were absolutely not okay with. They also viewed the English schools as depraved and unfit for their sense of propriety. Plus, it wasn't like England was particularly concerned with the religious life of the colonists. In response to Virginia's plea for a seminary to save the souls of their colonists, was the reply "Souls?!? Damn your souls! Make tobacco." So Massachusetts and Virginia built their own schools. And then a group of Harvard grads decided that Harvard no longer met the needs of the unreconstructed Calvinists in Connecticut. So they founded Yale. The vast majority of the graduates of these schools did end up as members of the clergy, fulfilling the purpose set for them. And for more than four decades, that was plenty of schools. Two things combined to create to the more clustered founding of the last six colonial colleges: The First Great Awakening and increased inter-colony rivalry. The First Great Awakening saw an upheaval in American Protestantism that ended up dividing the old denominations and creating new ones. And as the rifts grew, different colonies became more strongly associated with certain denominations. And each denomination wanted a school. And the schools became points of regional pride. Princeton was founded by "New Light" Presbyterians who protested "Old Light" Yale's hostility to Evangelicals like George Whitefield and his imitators. Penn was officially nonsectarian. Just pointing that out — since it's easy to assume it was founded by Quakers, given that that's their mascot today. Columbia was initially "King's College," so it makes sense that it was founded as an Anglican school. Plus, as a formerly Dutch colony with a strong merchant history (rather than a religious one), New York was religiously pretty diverse for the time, so Columbia was also given a founding commitment to "religious liberty." Brown was founded by the Baptists who had been expelled from Massachusetts and settled in Rhode Island. However, it did not require its students to be Baptist. Rutgers was founded by revivalists of the Dutch Reformed Church. And Dartmouth was founded by "New Side" Congregationalist Puritans. Also, as a bit of fun intercolony rivalry, Dartmouth founder Eleazar Wheelock encouraged the separatists in New Hampshire who wanted to be a separate colony from Massachusetts. He offered to give the new colony the charter for Dartmouth — so long as he would be the governor. And as another bit of intercolony rivalry: It took New York 90 years to get around to building a college. It took New Jersey seven. And, prior to being its own colony, New Jersey had been governed by New York. Upstart New Jersey's establishment of Princeton was an affront to the New York that demanded a response. Well, first of all, almost no one graduated. It just wasn't a thing. A lot of students went for one or two years and then left. So few people went (less than 1% of the colonial population) and dropping out wasn't a big deal. By 1707, Yale had a grand total of 18 alumni. And founding father Alexander Hamilton never graduated (Aaron Burr did, though). Then there was the rioting. Contributing to the drop-out rate had to be the fact that the students had a lot of complaints, ranging from the quality of the food to the restrictions placed on their personal autonomy. Even though the only organized activities available were debate and literary societies, students chose neither voice nor paper to elucidate those complaints. They chose rioting. And, oddly, the rioting got worse after the American Revolution. For example, in 1800, after three students were expelled for disrupting morning prayers at Princeton, there was a riot that included gunshots. And one of the expelled students returned to beat the teacher he thought had turned him in. Seven years later, the same Princeton president faced a letter of protest regarding the suspension of three students. That scared him more, since he saw it as an illegal union by students against proper authorities. When he gave the students who signed the letter the option of being suspended or repudiating its contents, they once again gave up on reasoned argument and went with... yes, another riot. This is just a tiny, tiny part of the history of higher education in America. For instance, if you ever wondered where all those agricultural schools came from, the answer is the Morrill Land-Grant Acts. Or, there's the fact that athletics used to be almost entirely student-organized and run, but the schools started taking control because of how dangerous they thought the sports were. And dueling! In addition to riots, professors could end up challenged to duels if a student was unhappy. Or that opening up many class options rather than a single set of classes helped break the student unity that created successful riots and strikes.